TMA Sweden anordnade, för första gången i Stockholm, ett event i form av lunchseminarium den 21 mars. Inledningsvis berättade Nils Åberg, advokat och styrelseledamot i TMA Sweden, kort om TMA och dess kommande event. Därefter presenterade Mikael Kubu, rekonstruktör och koncernchef för Ackordscentralen samt Göran Kullenberg, fristående konsult, möjligheterna att utnyttja uppkomna skattemässiga underskott för att finansiera omstruktureringar, särskilt vid företagsrekonstruktion. En viktig lärdom var att det gäller att få in en ackordsvinst på rätt räkenskapsår och att störst möjligheter att utnyttja möjligheten att kapitalisera på underskott finns i bolag med tillgångar med höga bokförda värden men låga marknadsvärden vid en rekonstruktion, t.ex. inom industrin. Mikael och Göran berättade vidare om ett antal praktiska fall där detta tillämpats, bl.a. den spännande historien om rekonstruktionen av Copperhill i Åre. Alla som deltog i, det helt fullbokade, seminariet kommer få presentationen skickad till sig i PDF-format. Ett särskilt tack till dagens generösa värd Ackordscentralen som bjöd på lunchen! Den 9 mars anordnade TMA Sweden ett välbesökt evenemang hos Advokatfirman Carler i Stockholm med anledning av de förslag till ändringar om reglerna för företagsrekonstruktion som följer av den s.k. Entreprenörsskapsutredningen. Advokat Mats Emthén och professor Annina Persson, som båda var inkopplade i utredningen, höll ett intressant föredrag om de viktigaste förslagen gällande rekonstruktioner som läggs fram i utredningen. Flera frågeställningar föranledde givande diskussioner med den talrika publiken. Efter det uppskattade föredraget bjöd kvällens värd, Advokatfirman Carler, på förfriskningar och goda tilltugg. TMA Sweden held its annual Christmas Cocktail at the Radison Blu Hotel, Stockholm Waterfront, on the 6th of December. As usual, there was opportunity to mingle and get to know other members better. This year, the Cocktail was combined with a truly inspiring speech by the acclaimed author Gregg Vanourek. Gregg provided the participants with excellent food for thought, about finding balance and what is really important in life. He also gave good advice how to recognize and avoid the common traps of business and personal life. All in all, Gregg's motivational speech will surely be remembered by the participating members. TMA Sweden wishes all of its members a very Merry Christmas and a Happy New Year! We will be back in 2017 with several exciting events. 30 interested TMA Sweden members met at Mannheimer Swartling’s Stockholm office on November 17 to learn and discuss from other turnaround professionals. Three members provided cases to learn from. The story tellers sharing their experience (from left to right): Hans Lindén, Ulla Hemmi-Adolfsson and Carl Brodén. Hans Lindén started out, sharing his experience from turning around a SEK 500 million turnover company during a 12 month time. The challenge was that the company had delivery and quality problems at the same time as production had been moved from Sweden to Eastern Europe. With a background from larger organizations in the steel industry and within ABB, Hans could bring a lot of stability to the organization. What was needed was a change of culture and Hans drove the change from the bottom with a change of behavior, introducing lean methods, daily production meetings, etc. A lesson learned was that to change the culture, the behaviors needed to change – and the lean toolbox (with a lot of persistence) proved to do just that. Carl Brodén, from Roschier, shared his experiences of cultural clashes in a coupl of negotiation situations. First was a case of a Leveraged Buy-Out which went through a reconstruction. The mezzanine bond-holder took a very aggressive stance in the negotiations. The tone was not very productive and in the end the more senior lenders managed to secure their own debts whereas the mezzanine holder ended up with losing access to all securities. The second case was a case of cultural clash between countries. After a change of ownership a company ended up with a Russian owner, but with the lenders being Swedish. There was a lot of mistrust between the parties and also quite inflexible stances on the negotiation position. In the end, the parties found out each other’s objective, which resulted in a debt to equity swap that eventually gave the senior lending banks a good return on rather than bailing out as was a possible outcome. The lessons learned from this case, was that it is always good to listen and learn, as well as that some creativity to structure a company (and its debt) can sometime end up with a better solution for all parties involved. Lastly, but not least, Ulla Hemmi-Adolfsson, from Altelate Consulting, presented her experience, when leading the IBM Technical Services in Sweden during a year. Ulla and her team had to start the year with some cost overruns from previous year and it did not look to good. Ulla increased the transparency and raised the awareness among the consulting staff of the situation. Changing the culture into a business-minded focus was needed to get everyone contributing to sales and business development. She concluded that to get back to “black and back on track” she needed to look both short term and long term – in the short term, the organization to on consulting projects that were good for business in the short run, but she also had to ensure the organization found a strong focus for the future. After the presentations, the host of the evening, Beth Topolovsky, Stinson partners moderated the discussion. After the formal part, the group moved over to mingling and enjoying the hospitality of Mannheimer Swartling – many thanks to Christoffer Monell, for making this possible. Nils Åberg of TMA Sweden provided a warm introduction to Heinz Weber who is the Chairman of Gordon Brothers Europe. Heinz career has included roles in commercial banking, restructuring advisory and portfolio workout roles which has led neatly to his current role with Gordon Brothers. The 100 year old firm provides a service which includes advising lenders, owners and management teams on value realization strategies but also implementing those strategies and providing a guarantee of the financial outcome of their projects. Heinz explained two themes which are driving distress in retail. Successful retailers are always tempted to expand abroad but retailing remains a very local business and this means that many retailers follow their international expansion strategy with a requirement to exit from the countries where they have been unsuccessful. The other main trend is the increasing digitalization of retail with shoppers increasingly using multiple channels (e.g. apps and physical stores) to complete their purchase or interaction with a retailer. Those retailers which are not adapting their business model either have to catch up quickly or will end up in serious trouble. The critical factor which Gordon Brothers look for when assessing a challenged retailer is the brand. As long as brand value remains, there is a possibility to reinvent the business. After the brand, Gordon Brothers look to the value of the stock including stock which the retailer has not yet taken into its own premises but is sitting somewhere in the supply chain and intended for delivery to the retailer. Unlike traditional insolvency practitioners, Gordon Brothers will look to the potential value that can be realized from existing stock and by pulling through the stock which has not yet been delivered. Critical to Gordon Brothers approach is employing experienced sales and operations staff who have to have been through a personal “crucible moment” – as Heinz so colourfully called it – where they have faced a crisis in their business and chosen the tough path of reacting and working through the crisis rather than walking away. Heinz then told the story of a number of case studies across Europe and covering different types of retailers such as traditional department stores, DIY stores and fashion retailers. These cases ranged from maximising realisations from an exit to restructuring the business model of a branded clothes retailer to a virtual company which managed brands and franchise arrangements. Following this compelling presentation the members and presenters were generously provided with drinks and sustenance from our kind host, Jonas Rickardsson of PwC. Programmet för hösten är ännu inte helt satt, men i slutet av september/ början av oktober i Stockholm så räknar vi med att få ett utländskt perspektiv med hjälp av TMA Europes sponsor Gordon Brothers, som har en bred portfölj av tjänster som kan vara intressant för oss som jobbar med turnarounds. 20 oktober har vi en roundtable i Stockholm för medlemmar – temat är ”framgångsfaktorer inom turnaround” där vi kan lära av varandra. I slutet av november ska vi få ett perspektiv på den då nyligen avrapporterade utredningen ”Utveckling av innovations- och entreprenörsklimatet”, som bland annat berör hur rekonstruktionslagstiftningen kan förbättras – ett rykande aktuellt ämne som vi hoppas kunna ge mer insikt i. Givetvis kommer vi också att ha vår traditionella juldrink i början av december. För våra aktiviteter i Göteborg är ännu inga datum satta, men första evenemanget för hösten är tänkt att beröra finansieringsaspekten av en turnaround – mer information alldeles snart. På vår roundtable i april kom det bland annat fram idéer om nya sätt att träffas – mer fallstudier, middagar, möjlighet att genomföra företagsspel, med mera. Stor inspiration för oss i styrelsen! Vår arbetsgrupp i Göteborg börjar nu bli varm i kläderna. Under ledning av Peter Björnram, MAQS och med hjälp av Christoffer Monell, MSA, Tove Rosén Johansson, Wistrand, Sofia Regestad, Hammarviken samt undertecknad Fredrik Vernersson från TMA Swedens styrelse, så börjar programidéer formas och vi har också attraherat ett antal nya medlemmar. För den som vill veta mer, har förslag på aktiviteter eller är intresserad av att ingå i arbetsgruppen finns det stora möjligheter – kontakta någon i arbetsgruppen för en diskussion. Medlemskap i TMA Sweden – inte enbart i Sverige! Notera vänligen att TMA Sweden inte kommer att lägga ut någon information om enskild medlem utan dennes godkännande. Om du vill vara med i medlemsmatrikeln, e-posta vänligen IT och webb-ansvarig Nils Åberg nils.aberg@carler.se en helt kort beskrivning av dig själv, gärna tillsammans med ditt fotografi och eventuell firmalogotyp. Styrelsen har beslutat att till sig adjungera Annika Muskantor, Frideborgs. Annika är interim CFO och Chief Strategy officer med intressanta uppdrag. Hon kommer att tillföra styrelsen värdefulla erfarenheter. Peter Björnram, MAQS, som leder TMA Swedens etablering i Göteborg är nu också invald i styrelsen på senaste årsmötet. I övrigt består styrelsen av: Jonas Cunningham, EY, Niklas Körling, Wistrand, Krister Levin, Advokatbyrån Nova, Michael Maccallum, Deloitte, Beth Topolovsky, Stinson Partners, Nils Åberg, Carler samt undertecknad Fredrik Vernersson, McKinsey & Company RTS. Som vanligt tar vi tacksamt emot kommentarer och förslag – skicka mig gärna ett mail på e-postadress nedan eller ring mig på mobilen. Till sist önskar vi alla medlemmar en skön och varm sommar! TMA hade bjudit in till seminarium på temat Turn around in retail business med Wistrands advokatbyrå som värd. Seminariet besöktes av ett 40-tal deltagare. Kvällens värd genom Tove Rosén Johansson hälsade alla välkomna och berättade om TMA och lokalavdelningen i Västra Sverige. Härefter fick varje deltagare i panelen presentera sig själv och sin syn på kvällens ämne. Magnus Kroon inledde och berättade om sin bakgrund och att han tidigare bl a arbetat på Svensk handel. Magnus redovisade att detaljhandeln svarar för ca 11 % av BNP, att E-handeln blir allt viktigare samt att detaljhandeln påverkas, kanske mer än man tror, av valutakurser och väder. Härefter var det Lena Smeby Udesen ifrån Swedbank som tog över och berättade om Swedbank och framhöll att det ifrån ett bank perspektiv var viktigt att löpande ha en dialog med kunderna och att om problem uppstår i god tid ta kontakt med banken för att få igång en dialog. Lena underströk att banken aldrig tillhandahåller riskkapital men alltid är öppen för konstruktiva lösningar om problem uppkommer. För Swedbank är det också viktigt att kunderna har en solid affärsmodell som på ett bra sätt utnyttjar möjligheterna som e-handel innebär. Hon såg utifrån ett kreditperspektiv en tillväxt när det gäller dagligvaruhandeln, att hemelektronik i stort sett ligger still samt att sport och fritid minskar. Anne-Marie Pouteaux redovisade sin syn på turn around och de lagregler som närmast är avsedda att användas. Ann-Marie kom in på lagen om företagsrekonstruktion och även konkurslagen. Sammanfattningsvis var det Ann-Maries uppfattning att åtgärder måste vidtas i tid och att en företagsrekonstruktion måste vara väl förberedd och gå fort om man skall lyckas. Slutligen var det Björn Abilds tur att presentera sig och Hemtex. Björn berättade att han arbetat inom ICA-sfären under många år och gjort turn arounds i olika verksamheter. Björn framhöll ett antal viktiga faktorer som måste uppfyllas om man skall lyckas med en turn around – framförallt hur man skapar en kultur som vill och kan vinna. Härefter vidtog en intensiv paneldebatt ledd av Fredrik Vernersson, President TMA Sweden. Paneldebattörerna fick möjligheten att utveckla sina åsikter om vad som är viktigt att tänka på när man arbetar med förändringsarbete inom detaljhandeln. Samstämmigt var att det är viktigt med tempo och fokus. Efter frågestund blev det mingel med mat och dryck samt möjlighet att ställa frågor till debattörerna. Sammanfattningsvis en trevlig och lärorik kväll som uppskattades av deltagarna. On 17 May TMA Sweden held a much appreciated event on the theme of “Bad payers – cant’s pay, won’t pay”. 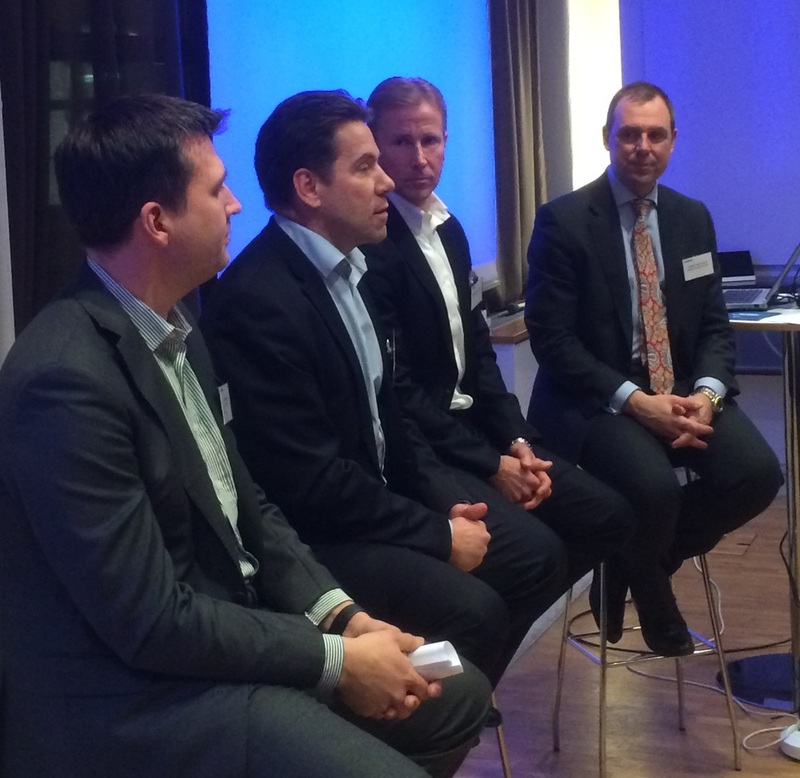 The event was hosted by Björn Dahl of KPMG and held at KPMG’s offices on Tegelbacken in the city center of Stockholm. The debate was moderated by TMA Sweden board member Michael Maccallum, Head of Restructuring at Deloitte. The panel consisted of Oskar Ekenger representing SEB’s Special Credits Management department; Jeremy Lipshitz who is a core member of the PwC Sweden Business Recovery and Restructuring practice; Todor Panayotov with vast experience from recovery, restructuring and balance sheet optimizations and Carl Hugo Parment, Partner with White & Case in Stockholm focusing on different aspects of banking and finance law, debt capital markets and financial restructuring/ insolvency. The discussion commenced with the panelists identifying the first signs of a “bad payer” and pointed out initial triggers such as financial engineering, activation of extraordinary costs, factoring among others. Gradually debtors tend to avoid contact with creditors and the ultimate signs are the breaking of covenants. The panelists were in consensus that the understanding of the debtor’s situation is key to a successful turnaround/solution. Lenders often have trouble understanding the gravity of the situation and the panelists expressed that they see a problem with lenders being too invested to allow themselves to understand. Therefore, knowing your customer goes beyond filling in paperwork; but actually understanding the complications and challenges of the debtor. The question of directors’ liability in was raised and our panelist could (more or less unanimously) conclude that there are big differences in practice between the Nordics and the rest of Europe and not the least the USA. It is therefore important to “analyze your toolbox” before the situation has gone out of hand. This can include both drafting of contingency plans as well as “stripping the oxygen” at the right time. All our panelists agreed however that reconciliation with a customer with payment issues is possible and sometimes these situations – if successful – lead to strong relationships between the parties. The evening was ended with drinks and food sponsored by the generous host, KPMG. Magnus Håkansson förklarade att det som är speciellt med företag inom retail är multilokaliseringen (verksamheten utspridd på många platser ofta långt från huvudkontoret) samt relativt långa ledtider vid sortimentsbyte. Jan Åberg berättade hur banken ser på kreditengagemang i retailföretag, bl.a. att banken uppskattar ordning och reda och gärna ser att man får del av relevanta nyckeltal, bl.a. bruttomarginal. Vidare föredrar banken att retailsbolagets ledning visar att man är proaktiva. Jan ansåg emellertid inte att banken ska styra bolaget för hårt eller lägga sig i för mycket. Panelen diskuterade hur lång tid en turnaround inom ett retailbolag bör ta. Det fanns konsensus om att en sådan process tar i anspråk någonstans mellan 9 och 24 månader. Kommunikation är en viktig del av en turnaround som panelen också diskuterade. Magnus Håkansson slog fast att grunden för bra kommunikation var en solid plan som därefter kommunicerades snabbt och intensivt. Vad gäller kommunikation med de anställda gjorde Magnus en viss skillnad på anställda vid huvudkontor och ute i butikerna. De sistnämnda bör så långt som möjligt hållas på gott humör för att inte försäljningen ska drabbas. När det gäller anställda vid huvudkontoret krävs snarare en ”sense of urgency”. Niklas Körling berättade hur kommunikationen kan fungera i konkurs inom retailföretag. När det gäller ledningen av bolag under turnaround beskrev Magnus Håkansson att det fanns ett behov av att vara osentimental. Små kärnteam förordades med större behov av auktoritär ledarstil än vid ”business as usual”. Retailbranschens utmaningar och möjligheter diskuterades avslutningsvis av panelen, särskilt mot bakgrund av de strukturella förändringar som håller på att äga rum i branschen genom framförallt näthandel. Magnus Håkanssons uppmaning var att omfamna förändringsbehovet och på så sätt bli en vinnare i förändringens tidevarv. Som vanligt var det mingel både före och efter paneldebatten med utmärkta möjligheter att knyta kontakter och lära känna varandra bättre. TMA Sweden vill särskilt tacka kvällens värd Deloitte för god mat och dryck! Onsdagen den 10 februari träffades ett drygt fyrtiotal intresserade på Deloittes kontor i Göteborg för att lyssna på och delta i en paneldebatt om ”Företagsobligationer i företag med ekonomiska problem”. Det var en intressant blandning av jurister, bankrepresentanter, omstruktureringsspecialister från revisionsbyråerna samt ekonomidirektörer / CFOs från näringslivet. Carl Brodén från Roschier introducerade företagsobligationerna och påpekade skillnaderna mellan företagsobligationer och bankkrediter – de förra är avsedda att omsättas vilket ofta leder till en samling kreditgivare som är anonyma och att obligationsinnehavarna inte har en frekvent kontakt med det utgivande bolaget. Därför kan det bli en överraskning när det utgivande bolaget får ekonomiska problem – man märker det inte förrän räntorna inte kan betalas. Att obligationerna handlas innebär också ett annat krav på informationsplikt. Jonas Olsson från Swedbank fortsatte med att visa på hur volymerna av utgivna obligationer ökat under de senaste 5 åren även om 2016 hade fått osedvanligt trög start. Typiska räntenivåer ligger mellan 3,5%-7% och löptider på 3-5 år. För många företag är obligationer fortfarande ett av få sätt att kunna skaffa mer kapital. Jo Forfang från Nordic Trustee förklarade agentrollen på obligationsmarknaden – i Norge är det obligatoriskt med en trustee som kan samla obligationsinnehavarna och det underlättar hela kommunikationen mellan utgivande bolag och de som innehar obligationerna. Idag kräver många investerare att obligationen har en trustee som emitterande bolag får betala för. I händelse av att utgivande bolag får betalningsproblem så kan en trustee spela en avgörande roll till att få till stånd en lösning. Michael Maccallum från Deloitte gav ett internationellt perspektiv och talade om de olika typer av investerare som finns – inklusive de som ser obligationerna som ett sätt att köpa bolaget genom en debt-to-equity swap. Internationella investerare jagar också avkastning på ett annat sätt. Jonas Olsson fyllde i att den nordiska marknaden blir allt mer internationell från att för ett par år sedan varit mycket nationell där svenska bolag gav ut obligationer till svenska investerare. Därefter vidtog en debatt modererad av Niklas Körling, Wistrands advokatbyrå. Frågor som berördes var obligationernas företräde eller ej framför bankkrediter vid rekonstruktion, de komplexa skuldstrukturer som kan uppstå när ett rörelsedrivande bolag har bankkrediter och ett holdingbolag emitterar en företagsobligation. En annan fråga som berördes var hur aktieägarna behandlas i en rekonstruktion med en debt-to-equity swap – typiskt låter man dessa behålla 3-5% av aktierna för att skapa välvilja. Efter en livlig debatt så avslutade Jo Forfang med att konstatera att alla problems moder är avsaknaden av likviditet – när emitterande bolag inte kan betala räntorna så blir det problematiskt. Panelen kunde också konstatera att den kortsiktiga utblicken för obligationsmarknaden var rätt dyster – detta i sin tur kan leda till refinansieringsproblem. Kvällen avslutades med mingel och nätverkande där Deloitte bjöd på goda wraps och drycker. Så har ett nytt och fräscht år startat och snön har kommit och redan smält i södra Sverige. För TMA Sweden innebär det nya året att vi lägger ett intressant 2015 till handlingarna och kan se fram emot en spännande vår med programpunkter som vi hoppas och tror kommer att kunna intressera er. Under 2015 var givetvis höjdpunkten att kunna stå som värdkapitel för TMA Europe conference i Stockholm i juni – vi har fått mycket positiv feedback från när och fjärran. Tack till alla som deltog och allas om hjälpte till. Under hösten hade vi några väl efterfrågade event: Tillsammans med Swedish House of Finance och Roschier ordnade vi en fullsatt paneldebatt om företagsobligationer 22 oktober – intresset var så stort att vi tar och kör samma tema i Göteborg 10 februari. Vi hade också ett välbesökt samarrangemang med IFFR på Wistrands om företagsrekonstruktioner i teori och praktik 2 december. Mycket uppskattade diskussioner. Igår startade vi programmet för våren 2016 med ett evenemang i Göteborg. På Deloittes kontor i Göteborg ordnade vi en paneldebatt om företagsobligationer i företag med ekonomiska problem. Panelen består av Carl Brodén, Roscher, Jo Forfang, Nordic Trustee, Jonas Olsson, Swedbank samt Michael Maccallum, Deloitte modererade av Niklas Körling, Wistrand. Ett stort tack till Michael Maccallum för att vi kunde utnyttja Deloittes trevliga lokaler. 17 februari är vi hos Deloitte i Stockholm med en paneldebatt om turnarounds inom handel och retail. Paneldeltagare är Magnus Håkansson, CEO på RNB, Niklas Körling advokat/partner på Wistrand advokatbyrå Jan Åberg, CEO på FR&R Invest AB Swedbank Group, modererade av Fredrik Vernersson, PwC Strategy&. Programmet för resten av våren håller vi på att sätta just nu: Vi planerar för en middag med talare boka ett bord i tid samt round table diskussion för medlemmar kring ett intressant ämne – detta sker i mars och april, i skrivande stund är datum inte satta, men räkna med ett event i mars och ett i april. I maj förbereder vi en paneldebatt och i juni har vi vår traditionella sommardrink för att hälsa sommarn välkommen. För Göteborg har vi nu samlat en arbetsgrupp under ledning av Peter Björnram, MAQS. Denna grupp består av Christoffer Monell, MSA, Tove Rosén Johansson, Wistrand, Sofia Regestad, Hammarviken samt undertecknad Fredrik Vernersson från TMA Swedens styrelse. Vi kan tänka oss att samla ytterligare personer till denna arbetsgrupp för att få igång TMA Swedens verksamhet i Göteborg. Första evenemanget genomförde vi, enligt ovan, igår och vi har planer för ett evenemang i maj.
Lokalt vill vi också stärka banden mellan våra medlemmar – vi upprepar därför i år vårt round table för att lära känna varandra bättre och dela erfarenheter. Enligt programmet ovan blir det i Stockholm i mars eller april. I syfte att synliggöra bredden och det stora kunnandet hos våra medlemmar avser vi också att lägga upp en offentligt tillgänglig medlemsmatrikel på TMA Swedens hemsida. Varje medlem kommer där kort kunna beskrivas tillsammans med ett fotografi. Notera vänligen att TMA Sweden inte kommer att lägga ut någon information om enskild medlem utan dennes godkännande. Om du vill vara med i medlemsmatrikeln, e-posta vänligen IT och webb-ansvarig Nils Åberg nils.aberg@carler.se en helt kort beskrivning av dig själv, gärna tillsammans med ditt fotografi och eventuell firmalogotyp. Styrelsen har också beslutat att till sig adjungera Peter Björnram, MAQS, som kommer att leda TMA Swedens etablering i Göteborg. I övrigt består styrelsen av: Jonas Cunningham, EY, Niklas Körling, Wistrand, Krister Levin, Advokatbyrån Nova, Michael Maccallum, Deloitte, Beth Topolovsky, Stinson Partners, Nils Åberg, Carler samt undertecknad Fredrik Vernersson, PwC Strategy&. Som vanligt tar vi tacksamt emot kommentarer och förslag – skicka mig gärna ett mail på e-postadressen nedan eller slå mig en signal på mobilen. På uppdrag av styrelsen i TMA Sweden. Intresset och uppslutningen var stor när TMA Sweden tillsammans med IFFR (Institutet för Företagsrekonstruktion) anordnade seminarium om företagsrekonstruktioner idag och i framtiden. Kvällen inleddes med en presentation av advokat Nils Åberg om hur företagsrekonstruktioner går till enligt nuvarande lagstiftning. Därefter presenterades en case study av rekonstruktionen av Sensia-koncernen. Presentationen gjordes av Johan Bennarsten, som bl.a. var VD under pågående rekonstruktion tillsammans med advokat Mats Emthén som var rekonstruktör. Den sista delen av seminariet hölls av Mats Emthén tillsammans med advokat Ola Sellert och handlade om hur lagstiftningen om företagsrekonstruktioner kan och bör se ut i framtiden. Kvällens generösa värd var Wistrand. TMA Sweden höll ett lyckat och uppskattat seminarium om företagsobligationer i Stockholm den 22 oktober. Ett rekordstort antal besökare fick ta del av intressanta presentationer och en spännande paneldebatt mellan Anton Alsö (If), professor Bo Becker (Handelshögskolan), advokat Carl Brodén (Roschier) och Erik Saers (Nordic Trustee). Moderator var advokat Nils Åberg (Carler). Samarrangör var Swedish House of Finance. Kvällens generösa värd för arrangemanget var Roschier. För de som inte hade möjlighet att närvara genomförs ett liknande arrangemang i Göteborg den 10 februari 2016. Håll utkik på hemsidan för närmare information.